When your pawrents were children, they had to get vaccines before they went to Kindergarten. Yep, it's true! When YOU were a teeny little pup, you too, had to get a series of vaccines called 'puppy' shots. These are kind of like the same thing. Now, here's the deal. AFTER the pawrents had their shots, did they have to CONTINUE to get shots, year after year? I don't THINK so! Yet, why is it that WE 4-legged ones are forever reminded by a little postcard each year to come in for our 'annual vaccines?' Doesn't this seem a bit, well, unfair and fishy to you? It sure does to me! So, what do you do with regards to all the vaccines, you may ask. I shall be more than happy to share my opinions with you! Me, Dogtor Cheli, had my puppy shots AND Rabies, as necessary. Yes, indeedy! The puppy shots are a series of three sets of shots and provide the innoculations for the BIG ones. Rabies shots are required by law. When it came time for the so-called annual 'boosters,' this is when my mama her research to work for ME. Yes, indeedy! Instead of just getting the vaccinations when 'reminded,' mama said, "No way! I want Chelsea to have her TITER LEVELS tested, please." Titer testing is a test that shows how much immunity or antibody protection levels (titers) are still in the system from the original vaccinations. Puppies receive many natural immunities from their mama's milk and system. By the age of 6-months, puppies' immune systems are fully developed! Conscientious puppy owners should have also had their puppies fully immunized by this time as well (all puppy shots). Puppies' immunities are now 'set' and getting any additional boostesr can only lessen or negate the antigens from the original puppy shots! EEEK! Guess what…I am now 10-years old and my immunity is still EXCELLENT. This means I have had to get just ONE additional vaccination. What does this tell you? I would venture to say that it shows that MOST people will vaccinate their pets without giving any thought to whether or not it is a necessity to do so! How much does Titer Testing Cost? Is it really worth the cost? Vaccinations specific to the Shih Tzu? There are two vaccines included in the 'cocktail' of shots that may not be necessary for Shih Tzus. Check and see if you veterinarian is including Leptospirosis and Corona in the vaccine cocktail. The Leptospirosis strain has been the cause of many a Shih Tzu's allergic reactions to vaccines. The Corona strain is now also not recommended. 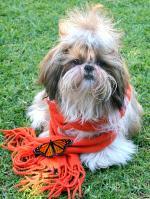 Shih Tzus can be prone to some health issues. Knowing your fur-friend and watching out for oddball symptoms can be very helpful in keeping those vet bills down. Reverse Sneezing: If your dog starts hacking like he/she can't breathe, then this is a reverse sneeze! Instead of freaking out, simply put your clean fingers over your baby's nostrils for a few seconds and the sneeze will stop (as will that horrendous sound! ).